Okay first of all the creature in the header here looks like something from a nightmare. Just, so creepy. 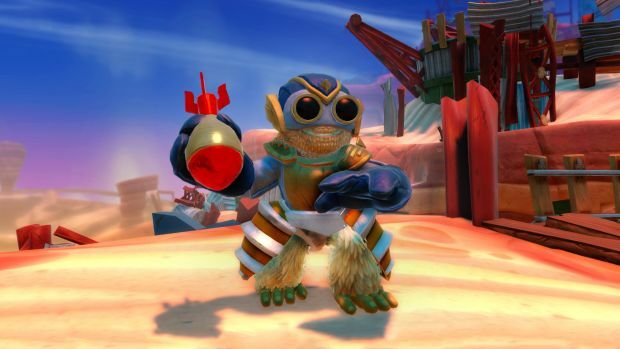 Well whatever it is, it's one of four new Skylanders playable in SWAP Force. Two of them are also just normal Skylanders in that you can't split their bodies in half and create new creatures like a mad scientist. Boom Jet is the one above, and is an air type that flies around on a rocket. The gorilla is called Grilla Drilla, and is able to transform his legs into a giant drill. As for the non-swappable Skylanders, there's Slobber Tooth, a dumb looking dinosaur-like creature. Last of the new reveals is Zoo Lou, who reminds me of Po from Kung Fu Panda.